If you need help getting around the Resort, this is the answer for you! Want to get around the campground with ease? 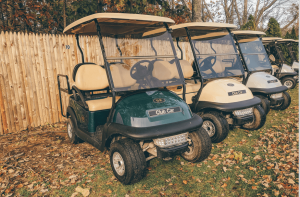 Grab one of our golf cart rentals for a day or the whole week! Golf carts rent out quickly, so please inquire at the same time as reservation. Please note: Personally owned golf carts are not allowed for insurance purposes. We require a security deposit of $200 upon pickup of golf cart. You may use a credit card or cash.